​Sleepy G Farm is located in the small community of Pass Lake, 45 minutes East of Thunder Bay. The farm is 160 acres with 8 acres under intensive vegetable production or cover crop, 80 acres in hay and pasture with remainder of the property in mixed boreal forest. An additional 100+ acres of cleared land are leased for cattle grazing and haymaking. 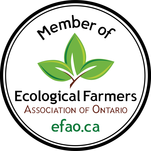 Our vegetable and hay fields are Certified Organic by EcoCert Canada, we are strong proponents of Organic agriculture and manage the farm accordingly. We employ the use of quality hand tools, tractors, and oxen to accomplish farm work. We believe that the return of small farms will be the next agricultural revolution, and Sleepy G Farm is excited to be a part of it!